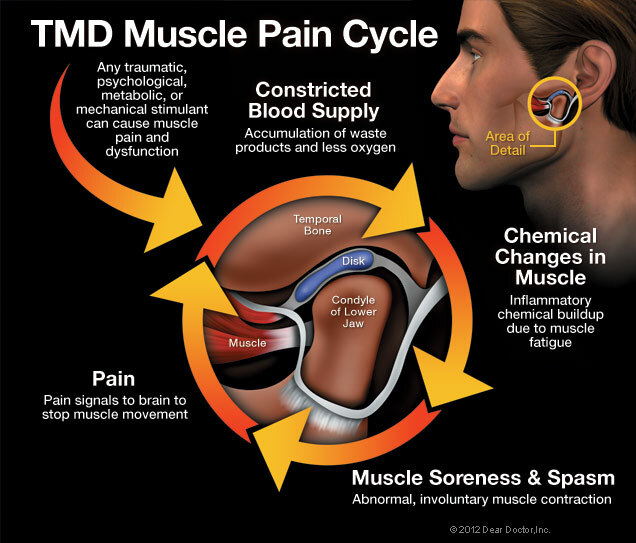 TMD, then, describes a group of conditions characterized by pain and dysfunction of the TMJ and/or the muscles surrounding it. 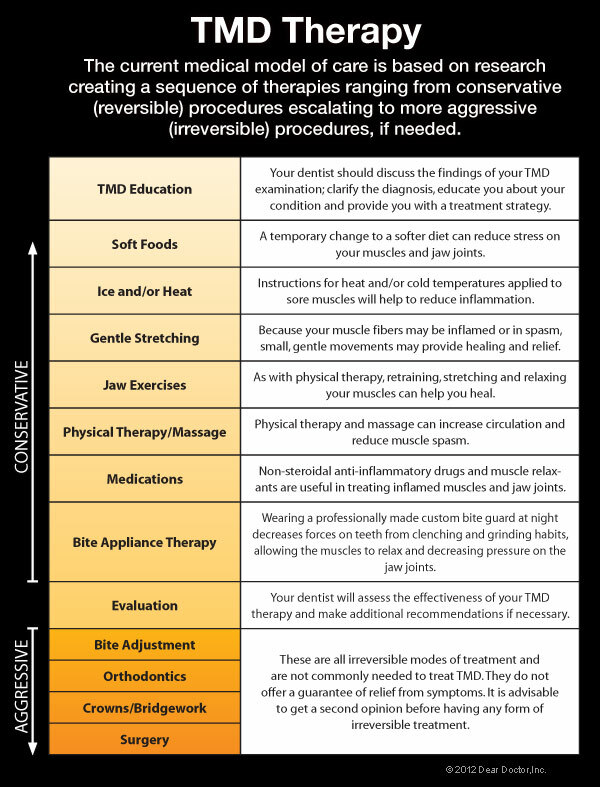 It's not always so easy to figure out exactly what's causing these symptoms, but the good news is that most TMD cases resolve themselves with the help of conservative remedies we will recommend for you to do at home. In fact, it's important to exhaust all such reversible remedies before moving on to anything irreversible, such as bridgework or surgery. The two TMJs that connect your lower jaw, the mandible, to the temporal bone of the skull on either side, are actually very complex joints that allow movement in three dimensions. The lower jaw and temporal bone fit together as a ball and socket, with a cushioning disk in between. Large pairs of muscles in the cheeks and temples move the lower jaw. Any of these parts — the disk, the muscles or the joint itself — can become the source of a TMD problem. If you are in pain, or are having difficulty opening or closing your jaw, we will do a thorough examination to try to pinpoint the problem area and suggest appropriate remedies. As with any other joint, the TMJ can be subject to orthopedic problems including inflammation, sore muscles, strained tendons and ligaments, and disk problems. We also know that TMD is influenced by genes, gender (women appear to be more prone to it), and age. Physical and psychological stress can also be a factor. In some cases, jaw pain may be related to a more widespread, pain-inducing medical condition such as fibromyalgia (“fibro” – connective tissues; “myo” – muscle; “algia” – pain). Muscle Pain — This can be felt in the cheeks (masseter muscles) and temples (temporalis muscles), where the two big pairs of jaw-closing muscles are located. If you feel soreness and stiffness upon waking up in the morning, it's often related to habits such as clenching and/or grinding the teeth at night. If you have this type of nocturnal habit, we can have a nightguard custom-made for you that should be very helpful in decreasing the force applied to your teeth, which will in turn allow your muscles to relax and relieve pressure on your jaw joints. Other self-care remedies are discussed below (please see Relieving the Pain). Joint Pain — Pain that's actually coming from one or both jaw joints technically would be described as arthritis (“arth” – joint; “itis” – inflammation) of the TMJ. When we look at radiographs (x-ray pictures) we find that some people have arthritic-looking TMJs but no symptoms of pain or dysfunction; others have significant symptoms of pain and dysfunction but their joints look normal on radiographs. There is no cure for arthritis anywhere in the body, but medication can sometimes help relieve arthritic symptoms. Once we examine you, we will come up with a strategy for treating your condition and managing your pain. Sometimes a temporary change to a softer diet can reduce stress on the muscles and joints. Ice and/or moist heat can help relieve soreness and inflammation. Muscles in spasm can also be helped with gentle stretching exercises. Non-steroidal anti-inflammatory medications and muscle relaxants can also provide relief.